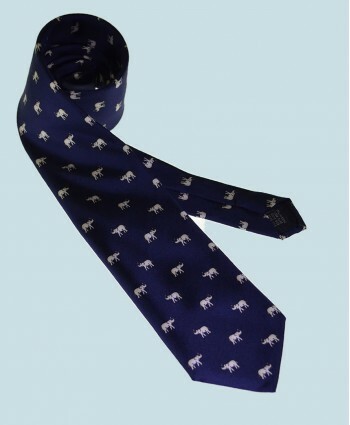 This classic silk tie features a neat pattern of white elephants with lucky raised trunks on a navy background.The tie is made of finest quality Italian printed silk. Approx Size:Tip to tip: 58" (147 cm)Widest point: 3.3" (8.5 cm)Dry Clean OnlyThe tie is tipped with an Elephant logo for Tara, the elephant behind the founding of Elephant Family the UK's leading charity working to conserve the endan.. 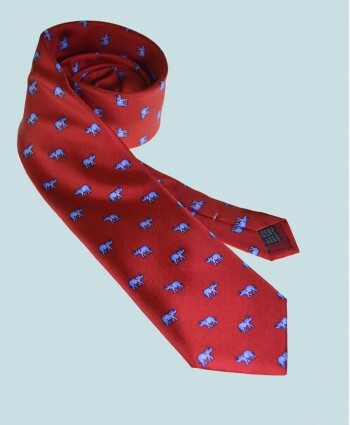 This classic silk tie features a neat pattern of light blue elephants with lucky raised trunks on a bright red background.The tie is made of finest quality Italian printed silk. Approx Size:Tip to tip: 58" (147 cm)Widest point: 3.3" (8.5 cm)Dry Clean OnlyThe tie is tipped with an Elephant logo for Tara, the elephant behind the founding of Elephant Family the UK's leading charity working to conserv.. 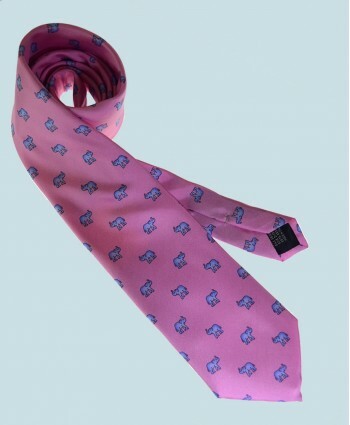 This classic silk tie features a neat pattern of light blue elephants with lucky raised trunks on a dusky pink background.The tie is made of finest quality Italian printed silk. Approx Size:Tip to tip: 58" (147 cm)Widest point: 3.3" (8.5 cm)Dry Clean OnlyThe tie is tipped with an Elephant logo for Tara, the elephant behind the founding of Elephant Family the UK's leading charity working to conserv.. 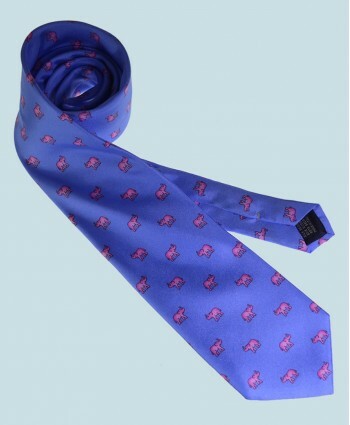 This classic silk tie features a neat pattern of rose pink elephants with lucky raised trunks on a light blue background.The tie is made of finest quality Italian printed silk. Approx Size:Tip to tip: 58" (147 cm)Widest point: 3.3" (8.5 cm)Dry Clean OnlyThe tie is tipped with an Elephant logo for Tara, the elephant behind the founding of Elephant Family the UK's leading charity working to conserve.. 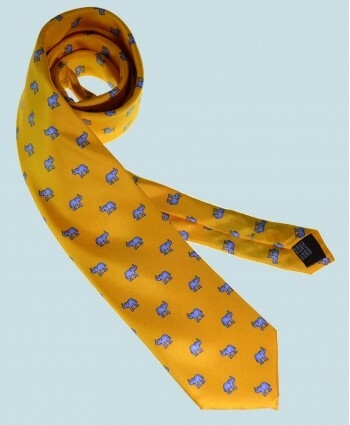 This classic silk tie features a neat pattern of light blue elephants with lucky raised trunks on a sunflower yellow background.The tie is made of finest quality Italian printed silk. Approx Size:Tip to tip: 58" (147 cm)Widest point: 3.3" (8.5 cm)Dry Clean OnlyThe tie is tipped with an Elephant logo for Tara, the elephant behind the founding of Elephant Family the UK's leading charity working to c..